Summary: A pair of sisters find themselves at a crossroads in this dazzling new novel from the #1 New York Times bestselling author of Something Borrowed, Where We Belong, and The One & Only. 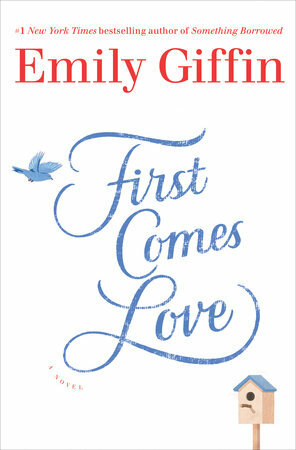 First Comes Love is a story about family, friendship, and the courage to follow your own heart—wherever that may lead. I have always loved the way that Emily Giffin portrays women in her novels. She just gets it -- if you know what I mean. Her latest novel FIRST COMES LOVE is no different. This book explores the lives of two very different sisters who are still reeling fifteen years after a major tragedy hit their family. Josie and Meredith are somewhat typical sisters, or at least their childhood relationship was fairly typical. They loved each other, but they sometimes annoyed each other... and they even disagreed. However, one night their brother was killed in an automobile accident, and their lives were forever altered. Fast forward fifteen years... Josie is a first grade teacher who is still single and ready to give one more guy a chance before deciding, once and for all, that marriage isn't in the cards for her. She is desperate to have a baby, and when she ends up teaching her ex-boyfriend's daughter, she feels an even greater desire. She decides that with or without a husband, she is ready to explore other options! Meanwhile, Meredith seemingly has it all. She has a generous husband, a successful career as a lawyer, and beautiful four year-old daughter. However, as often is the case with some women, Meredith doesn't feel fulfilled. She isn't sure she wants to have another child and she's not exactly satisfied in her marriage or her career. In fact, she's wondering if she chose the "right" path instead of following her heart and becoming an actress. As the fifteen year anniversary of their brother's death approaches, secrets from their past come to light. The two sisters feel even more tension in their relationship than normal, and maybe that's because each one of them is struggling with some inner demons. As they both begin to learn about themselves and deal with their life choices, they realize that they actually do love and need each other in many ways. I really, really enjoyed FIRST COMES LOVE. It's an easy-to-read book that's perfect for the summer months; however, it's definitely not light and fluffy. That's not to say that FIRST COMES LOVE isn't fun though. It's extremely entertaining and there are a lot of funny scenes, but it is also an insightful book about loss, grief, and families. I loved it! One of the things I appreciated most about FIRST COME LOVE is how well developed both Josie and Meredith were. I honestly can say that I related much more to one of the sisters than the other, but I liked both of them. Having said that, they both drove me crazy too! There were times when I wanted to shake them because I thought they were being so short-sighted... and then I reminded myself that there was a lot of baggage there due to the loss of their brother. Another aspect of this novel that Ms. Giffin nailed was the relationship between the sisters. Fortunately, my sister and I don't have quite the tense-filled relationship that Josie and Meredith did; however, I'm sure she'd tell you that I drive her crazy sometimes! We also don't have very different personalities, but I know many siblings who do. I'm sure there are a lot of women out there who will relate to the their relationship. I haven't mentioned this until now, but I thought both Josie's and Meredith's relationships with the other people in their lives were also very well developed. Josie was dating one guy, living with another and trying to find a sperm donor for a baby. Needless to say, she kept things interesting; and I loved the dynamic she had with men in her life. Meredith, on the other hand, was much more stable (in appearances only); and it was very honest how her marriage and motherhood were portrayed. And finally, I loved seeing how these two women grew throughout the course of the story. Needless to say, the loss of their brother affected them both deeply whether they admitted it or not. However, they also were responsible for a lot of their own decisions regardless of what happened fifteen years ago. It was interesting to see how both women looked closely at their own lives and eventually made decisions that would help them achieve what they achieve happiness. It was extra-special that these insights also helped them to forge a better relationship. I think FIRST COMES LOVE would make a terrific book club pick! There is a reading guide on the author's website with fourteen questions. Some of the themes you might want to explore include loss, grief, acceptance, marriage, motherhood, sisterhood, families, friendship, goals, career, love, and forgiveness. Overall, FIRST COMES LOVE will be a treat for fans of Ms. Giffin's, and I'm certain it will bring some new ones into the fold. Highly recommended! Thanks to the publisher and NetGalley for providing an e-copy of this novel. I love books that are fun and still explore important topics. This sounds terrific!